Are you the type to dwell on the bad stuff and not acknowledge what’s going well? You might have negativity bias and Jennifer Bridges, PMP, says it can be poison to your project. If you’ve not heard of negativity bias, Jennifer defined it as a psychology term meaning the phenomena by which humans give more psychological weight to bad experiences than good ones. She added that researchers assert that negative emotions have an impact close to three-times stronger than positive ones. Think how this can impact a project. Projects have plans, but as any project manager knows those plans must be fluid to adapt and change to the issues that always arise. As things change and go wrong, you start accumulating bad experiences, which in turn can establish a negative bias. That then can inflect a project manager’s wisdom. Jennifer gave a few examples of how negativity bias can act poorly on a project manager’s ability to do their job. Data analysis is tarnished by bad experiences and believe that things will turn out badly again. Managing team members, especially those that are exhibiting negative behavior, is going to have a negative spin on how you deal with the whole team. Communicating with stakeholders is often hearing or relating bad news, which can set a precedent towards expecting bad news. Surrounding yourself with positive people who will help keep you from falling into a hole of negativity. While it’s not going to remove all negative thoughts from you head, it will give you a soundboard by which to see things with more clarity. Having more positive experiences is another way to tip the scales towards a more realistic view of the world. This can be done in any number of ways from listening to positive music, watching positive movies or videos, traveling to positive places and enjoying nurturing food and drink. You can reframe the situation by seeing the positive, because there is always good and bad to any situation. It’s a matter of perspective. Not everything can be spun positively, of course, but most situations aren’t as awful as they can seem when you’re coming from a place of negativity bias. Setting positive intentions and seeing the positive end of the project, truly visualizing that goal, can help you achieve success. This doesn’t remove bad experience but it helps lessen the psychological impact. Pro-Tip: While you have control over how you perceive a situation and can sap the tendency to retreat into negativity, it’s harder to change others, if not impossible. That doesn’t mean you have to accept their corrosive influence. Instead, deal with complainers with strategy, such as being sympathetic and redirecting them to action. 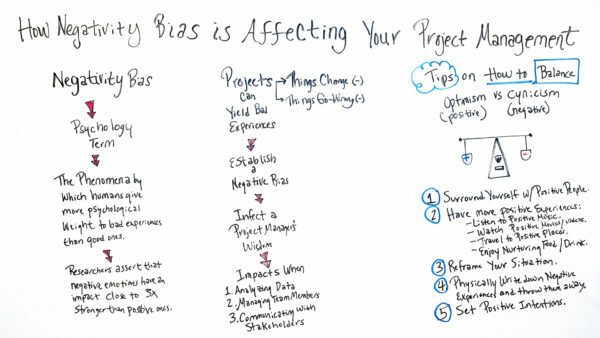 Today we’re talking about how negativity bias is affecting your project management. Well, what is negativity bias? It’s a psychology term and it means the phenomena by which humans give more psychological weight to bad experiences than good ones. As a matter of fact, researchers show and assert that negative emotions have an impact close to three times stronger than positive ones. So if you think about projects, you know, on most projects, things don’t always go right. As a matter of fact, things can change and things typically go wrong. So that can yield bad experiences for a project manager. It also can set up their negative bias and infect their wisdom. Well, how can that be done in what areas? Well, sometimes it’s seen in these areas where it can impact analyzing data. Well, think about it, coming to a conclusion about data after a bad experience. Maybe seeing data and saying, “Oh, well, the last time we did that this happened.” And it may be negative or may be concluding that the data will lead to something negative or bad. Also, managing team members. Maybe if there is a team member that is causing bad experiences or disrupting the team, maybe coming out with some negative or bad outcomes then that would set up a negative bias and, again, make conclusions for the next scenario or other team members. It also can impact when communicating with stakeholders. Again, maybe in the past, they’ve communicated that things aren’t going well or there were going to have to be some changes and communicating that to the stakeholders. Well, if that yielded a bad result or a bad experience then, again, that’s going to impact them. So let’s talk about some tips on how to balance optimism versus cynicism, the positive and the negative. So if you think of a balance where maybe if all of these bad experiences are having being three times stronger then we want to assert and we want to build in ways to add more positive to balance those psychological negative biases. Well, how do we do that? Number one, you probably hear a lot about the people you surround yourself with. So surround yourself with positive people, people that feed you encouragement and inspiration. Also, have more positive experiences by listening to positive music, music that inspires you, gets you motivated. Watch positive music or videos. Listen to inspiring people who speak. Travel to positive places. Could be, you know, some people are inspired by or love the beach. Maybe some people love the mountains or outdoors events. Enjoy nurturing food and even drinks. Some people love to relax and destress by having a cup of tea. You also can reframe the situation that you’re going through. Again, think about that situation and what happened and reframe it so that it can be positive. It doesn’t necessarily mean that if the series of events happened again that it may yield negative but program and set up how that could be positive. Physically write down those negative or bad experiences on a piece of paper and throw them away. I tend to write them down and burn them. And that seems to somehow get them out of my memory, out of my brain and just have a little ceremonial getting rid off or releasing. And also, set positive intentions. I set positive intentions for projects I have or big initiatives that are important to me because I like to visualize how I want it to go and how I want it to end. So if you need some additional resources and even a tool that can help you have good experiences on your projects to alleviate or minimize the negativity bias then sign up for our software now at ProjectManager.com.